Washe­d­out road and bridge from the Balama side. 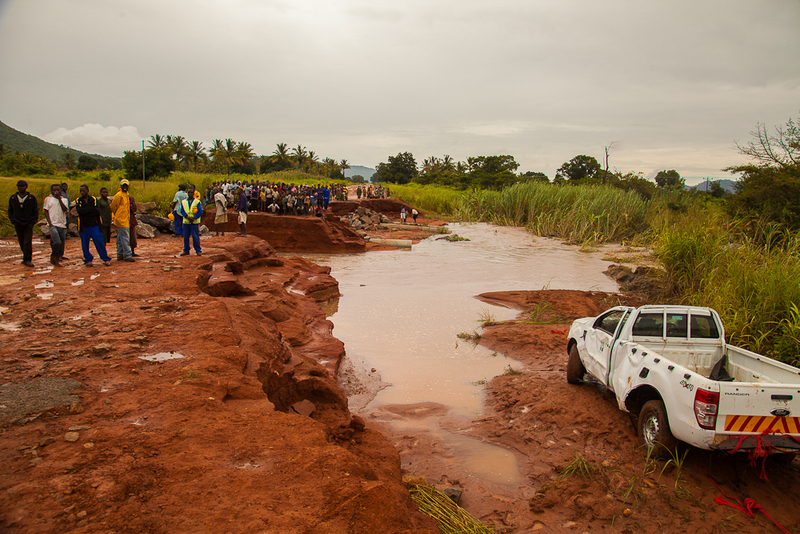 Way back in 2001, we had 3 days of mas­sive rains that took out 12 miles (20Km) of roads and 5 bridges. Over the week­end, we had 16 hours of rain and another 12 hours last night. 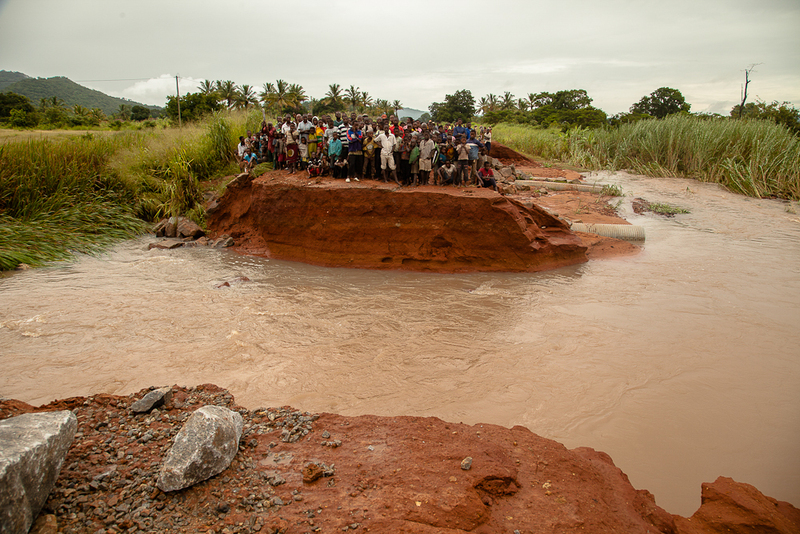 The rivers over­flowed last night, DESTROYING the bridge just 3 miles down the road from us, and WASHED AWAY over 15 yards/meters of the road. Road repair crew with first load of rocks to try to fill in the hole. The col­laps­ing road took the local cot­ton farm­ers pick-up with it. The dri­ver mirac­u­lously escaped, as the truck did a nose dive, flipped over, and then wedged itself against some trees as the bridge gave way when the truck tried to cross. That was one dri­ver with great angels for sure. (photo shows the truck being drug out of the river) We are tem­porar­ily an island, as all roads lead­ing to us from the north, west, and south are closed with flood­ing that won’t recede for at least 2 weeks. Cot­ton grower’s pick-up is pulled from the river. The local road builders have a camp here in Balama, and are busy haul­ing in huge boul­ders to fill the gap left in the road. Noth­ing like “being per­son­ally moti­vated” since they don’t like being trapped on our island. (Never seen them work so fast.) Not sure how long it will take them as that is a huge hole to fill and the rain is still falling, and the water is flow­ing hard through that area. This is where every­one learns patience whether they want to or not. Only way out is by heli­copter and I don’t have any of those in stock. (Tee Hee). Our vis­i­tor was already at the air­port when Eric dis­cov­ered the road closed, so she changed her ticket to next week. Hope­fully all will be back to muddy nor­mal by then. This is the REAL thing, folks! No photo shop needed in Mozam­bique, you just have to drive down the road with a cam­era. If it can be stuffed, stacked, or tied on, these “taxi” dri­vers will make it hap­pen. Note the bags of food on the hood of the car, plus there are at least 2 peo­ple INSIDE the car. 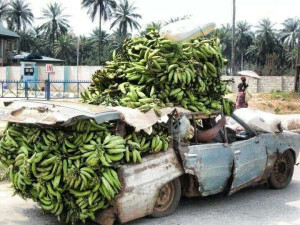 From the looks of the passenger’s huge bicep, plus the heavy green bananas on the roof, it’s no won­der the car is sag­ging in the mid­dle. OUR KIDS ARE SETTLED IN SCHOOL… In Moz. chil­dren only attend 4 hours of school daily due to an abun­dance of stu­dents and a short­age of teach­ers and class­rooms. There are so many first graders in Balama that they only study 2 hours/day. Our Youth Pas­tors pro­vide the stu­dents with morn­ing and after­noon activ­i­ties con­sist­ing of sports, games, and study time with indi­vid­ual tutor­ing. Por­tuguese classes con­tinue to help our “Mag­nif­i­cent 7” (the 7 new boys in the dorm) to catch up. With­out Por­tuguese, they will strug­gle to pass this year’s classes. Our Sat­ur­day AWANA GAMES pro­gram is extremely pop­u­lar with all ages of our chil­dren. 52 showed up for today’s pro­gram. Sadly, the Youth Night has been rained out for the last 2 Fri­days. Hor­ren­dous down­pours of rain started both Fri­days, about an hour before the pro­gram starts, mak­ing it impos­si­ble for the teens to walk to the church from all over town. We will keep on, keep­ing on, as per­sis­tence is the name of the game. All the chil­dren eagerly watch as our brick lay­ers and car­pen­ters work together to com­plete the play­ground equip­ment at our children’s cen­ter. Due to heavy rains and some chal­lenges get­ting the right build­ing mate­ri­als, con­struc­tion came to a halt this week, just as we were ready to mount our cus­tom built 8 ft. slide. It will be the only one in the whole county! 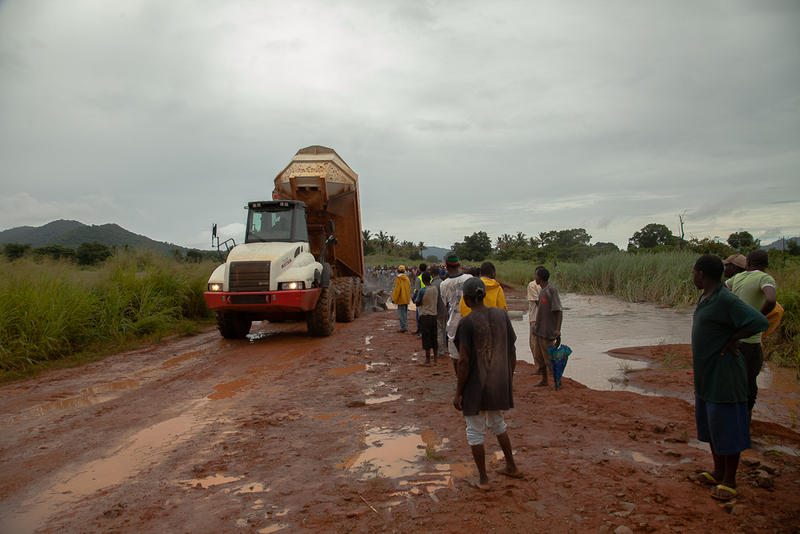 Our goal is to com­plete it by the end of Feb. if the rains don’t inter­fere with our morn­ing work hours. Three weeks ago, a group of out­side buy­ers came to Balama with the sole pur­pose of buy­ing up ALL GOATS that were of eat­ing size. Why? They started a busi­ness where they cook the meat and sell small pieces to men dig­ging ille­gally in the bush to har­vest semi-precious stones includ­ing Rubies. 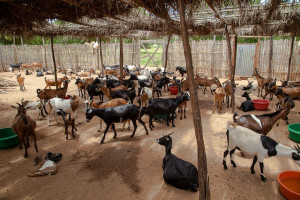 The demand for goat meat is tremen­dous at the moment with 2 dif­fer­ent mines (graphite and rubies), and the mul­ti­ple gas com­pa­nies all work­ing in this Province (state). Because these buy­ers were offer­ing $30/head MORE than the local price, some very bad men formed thiev­ing groups and began to raid the vil­lages in order to sell to these buy­ers. I heard that 2 vil­lages lost every goat they had. Not to worry, as no one came near our place as our goats are well guarded (super­nat­u­rally and naturally). 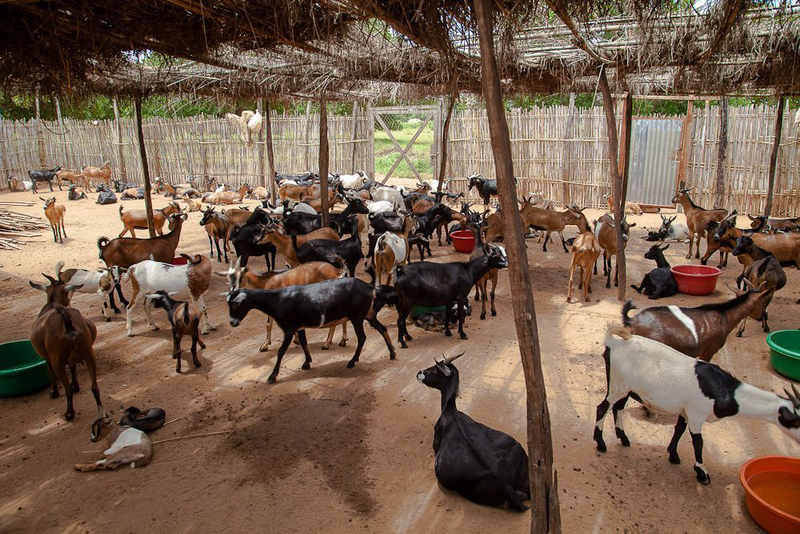 Sud­denly peo­ple began ped­dling in on bicy­cles, motor­bikes, and on foot with goats in tow to our Rovuma Goat Barns BEGGING us to buy their goats so the thieves wouldn’t get them. Most were very good breed­ing females. Coin­ci­den­tally, (duh more like divine inter­ven­tion), we’d just received sev­eral gifts from donors to help us increase our herd. Good breed­ing stock show­ing up at our door (instead of hav­ing to find them vil­lage by vil­lage) was a real PLUS! God works in mys­te­ri­ous ways for sure! The best goats in the Dis­trict were now being deliv­ered to our door. This is what God means by “ask and you shall receive”. We asked, expected, and then received! In sum­mary, we now have 153 females (90% are preg­nant), and 4 new males to ser­vice them. Our chil­dren will not lack for meat. One goat fed the 100 orphans in our 22 homes this week, mak­ing them a very happy bunch. That was our “back to school gift” to the chil­dren who nor­mally only get goat on major holidays. EVERYONE REMEMBERS CATTLE DRIVES, BUT A GOAT DRIVE? A goat herder south of us did a “goat drive” by herd­ing his goats 4 days through the bush to get them to us. No horses for these 2 men. It was all done on foot. Esti­mated dis­tance was over 15 miles. Yep they lost 5 on the way from exhaus­tion but that is the cost of push­ing them too hard. Thieves are still a prob­lem, but our goats are well guarded by a legion of angels who over­see our THREE, 3 man teams of goat guards. They work on a rotat­ing sched­ule and are as well armed as Moz. men can be. (Machetes, home­made bow and arrows, and sling shots). These men have used these tools to hunt small game since they were chil­dren, and are very accu­rate, espe­cially with the sling shots. Any­one com­ing around our barns at night will get a big sur­prise. The men may be dan­ger­ous, but the ANGELS play for keeps! SCHOOL DAYS KEEPS US HOPPING! Been a very busy week get­ting our 50+ kids out­fit­ted and in their proper classes (1st through 10th). Another 30+ are now reg­is­tered in the pre-school for 4, 5, and 6 year olds who don’t speak Por­tuguese. (Can’t go to 1st grade in Balama unless you speak Por­tuguese). Fit­ting shoes on all these chil­dren was the biggest chal­lenge of all. Thanks to Emma Clif­ford and her Mom, Amy, we were able to out­fit many of the orphans with brand new shoes from the USA. Emma and Amy orga­nized and packed 4 suit­cases full of socks, shoes, undies, and children’s clothes that last year’s June vis­i­tors hand car­ried to Africa for us. Those with feet that didn’t fit into any of the shoes got to go to the mar­ket to choose from the almost new shoes that are on sale there. It’s a big relief when all is said and done. THANK YOU Emma and Amy for mak­ing 25 orphans REALLY happy this year with new shoes. As you can see from the photo, my 2 year old King Cab has motor problems. Eric had the idea of dig­ging duel holes for the back wheels of our 7 ton truck, to lower the back end to the ground. 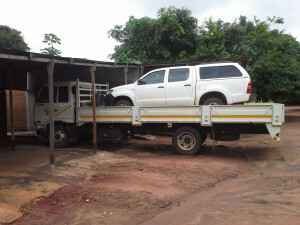 We then took 2 steel side pan­els off our 10 ton trailer as they are SOLID and make great ramps. Within 90 min­utes, 2 of our trac­tor crew had the hole dug, and Eric was able to drive the car up onto the ramp. The engine runs fine, but the rpm’s are lim­ited to 2000, so it only goes slow speeds. Gotta get it hooked up the com­puter analyser to fig­ure out what is wrong. The only one in the whole STATE is at Toy­ota in Pemba. They’ll leave at 4a.m. on Mon­day to take it. That’s a nice way of say­ing “blood­less cas­tra­tion with a spe­cial rub­ber band”. The photo shows the intense inter­est of our goat herders. It’s the first time I’ve done this (and I’m grate­ful for the won­der­ful teach­ing videos on You Tube!). We banded 13 small goats, and none of them are hav­ing any prob­lems after a week. With so many lit­tle boys run­ning around, this will con­trol who gets to breed and who doesn’t. We spent the whole day adding on to the barn, as I was about to have “Goa­teens” due to over­crowd­ing. The goat ver­sion of “sar­dines in a can” because the herd is now so large. We have pur­chased many more females bring­ing our breed­ing herd up to 110 females of all ages. Will tell you more about this in the next blog, as the sun is set­ting and the Bunny is beat after a long day of “barn rais­ing”. The goats appre­ci­ate the new “house” and set­tled in nicely. Was a 4 day marathon of den­tist vis­its, x-rays, cone scan, and then finally the extrac­tion on Thurs­day. The nor­mal X-rays didn’t show a prob­lem with the painful tooth, but the Cone Scan (sort of an MRI for teeth), showed a hid­den abscess that had gran­u­lated. A small part of the outer jaw bone next to the molar had also been destroyed, so no choice but to pull it. Then back to the den­tist on Fri­day for infec­tion pre­ven­tion so that I could return on Sat­ur­day to Mozam­bique. Ate my fill of ice cream, and made sev­eral new friends while in RSA. Am glad to be back, as there is no place like home. At 1:30a.m. 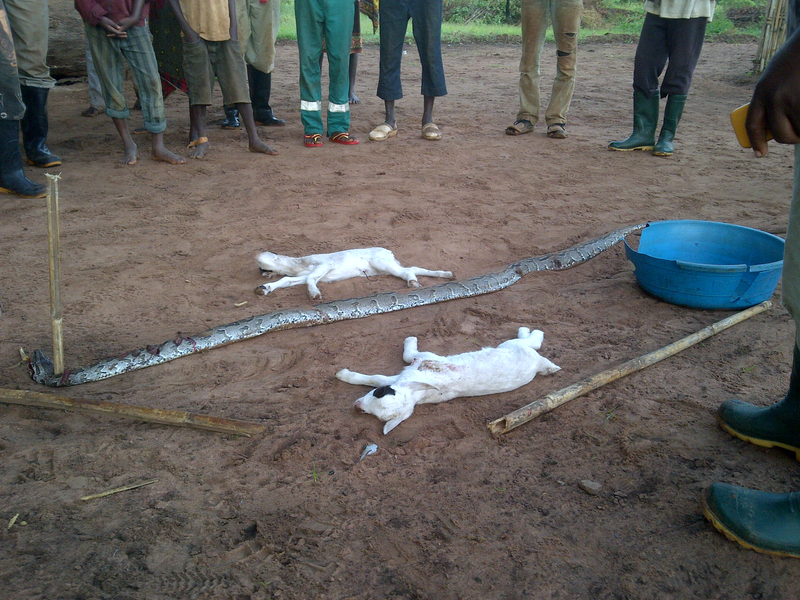 Sat­ur­day, Eric received a call say­ing a large python (7 ft. or 2.2 meters) had bro­ken into the goat cor­ral and squeezed to death the best baby goat twins in the nurs­ery. There are 3 night guards in the cor­ral each night, and they imme­di­ately spot­ted the snake when the goats sounded the alarm. Sadly, the babies were already wrapped in its death squeeze in the few sec­onds it took them to grab their bam­boos and get inside the pen. The snake made a hasty escape, tak­ing the men on a 45 minute “flash­light chase” before they could kill it. They tell me it was quite a scary fight in the dark against such a large snake with vicious teeth. Pythons are not ven­omous, but they are quick and very agile, pack­ing a bite that can rip tis­sue and leave a deep wound with a severe infection. In pre­ven­tion, we will be seal­ing the area under the 2 gates with con­crete bricks, since that is how it entered the cor­ral. The snake’s tracks showed it tried to get though the tightly woven bam­boo fence in sev­eral places, but couldn’t. How­ever, the space under each gate gets worn away by the many hoofs track­ing through that small area, thus mak­ing an easy entry way for snakes and small ani­mals. It upsets me greatly that these 2 lit­tle ones lost their life because none of us ever thought to block this off. The say­ing goes: “Africa shows no mercy.” When attacked by a snake or wild ani­mal, rarely does any­one get a sec­ond chance at life. The Momma goat is a large meat goat who pro­duces an abun­dance of milk. If held gen­tly, she will­ingly donates her large bag of milk to 2 of our baby goats, whose moth­ers have been dry since their birth. The “real thing” is much bet­ter than the milk sub­sti­tute, so I’m grate­ful these 2 lit­tle ones will benefit. Every mother knows how “fun” it can be get­ting mul­ti­ple chil­dren ready for the first day of school. We get to do it with 80 CHILDREN! The next 48 hours will be packed with dis­trib­ut­ing uni­forms made right on our base (3 months work), plus shoes, school mate­ri­als, back packs, and books. 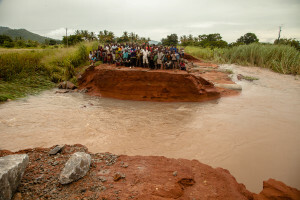 Mozambique’s schools are in ses­sion from Feb. 4th to end of Octo­ber. Our pre-school for our 4 and 5 year olds will also begin classes this week. An excit­ing time for every­one, espe­cially when our 3 year old orphans decide they are old enough to attend. They are always wel­come at our “Lit­tle Dis­ci­ples” pre-school even though they may only last until cookie break time. Bless­ings to all of you as you brave the bit­ter cold in the USA. We are just “wet, hot, and muddy” over here, as the rainy sea­son is in full swing.